Sea Witch by Sarah Henning (eProof) - Everyone knows what happens in the end. The rise of Hans Christian Andersen’s iconic villainess is a heart-wrenching story of friendship, betrayal, and a girl pushed beyond her limits—to become a monster. From Goodreads. I received this eProof for free from HarperCollin's Children's Books via NetGalley for the purposes of providing an honest review. By now, it will be no surprise that I love The Little Mermaid, and want to read all of the retellings. 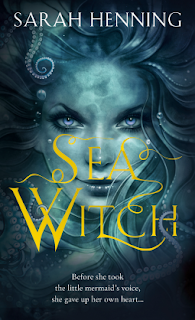 I have wanted to read Sea Witch for Sarah Henning for years, since the time it had a different title, and it's publication date was pushed back. I have been patiently waiting for this book the whole time, and my god, Sea Witch was worth the wait! Oh my god, I absolutely loved this story! As the title suggests, it's the origin story of the sea witch from The Little Mermaid, of how Evie goes from being a human teenager with magic, to the most feared under the sea. It's a prequel story to The Little Mermaid, but one that, in ways, is almost identical to the original; there is a mermaid who becomes human because she loves a prince she saved from a storm, and only has so long to make him fall in love with her before she dies. Very, very similar. Until the end, I thought this was a different take on a retelling; an origin story that took place at the same time as the original, rather than a prequel - what if the Sea Witch was originally friends with the mermaid and tried to help her, and in helping her became the Sea Witch? And while that is what happens in this story, while Annemette is a mermaid, she isn't the little mermaid of the story we know. There is more than one mermaid in the sea. I loved how this story was steeped in history. Sea Witch is, awesomely, set in Denmark, and Evie comes from a long line of witches, harking back to Burning Times witch hunts of the 17th century, when King Christian IV of Denmark was responsible for ordering people burned as witches. He had Maren Spliid burned at the stake just outside Ribe, who, in Sea Witch, is who Evie is descended from. Sankt Hans Aften is a celebration that happens before Lithasblot, a festival to honour the goddess Urdu, in which people burn effigy witch dolls into a bonfire - a celebration Evie must take part in to avoid suspicion, but a celebration that turns her stomach. Celebrating burning people like her, her people, her ancestors, knowing she would get the same treatment if anyone knew of her magic. The fact that real history makes up the backdrop to this story made it so much more credible, but also considering how horrifying that history is, it makes you really feel for Evie, and how she has to hide who she really is. But it also shows the danger Evie risks in trying to help Annemette. And the danger is real. Not just because witchcraft is so abhorred, but because she herself is disliked by most of her town. She is working class, the daughter of the Royal Fisherman, and it's her father's position, and how her aunt - who is also a witch - has saved the King's life many times, that allows her friendship with a prince. But everyone thinks she's reaching above her station, that she's got too big for her boots, and needs to be knocked down a peg or two. She is constantly judged, even though her friendship with Niklas is simply that, and she has no intentions of becoming his princess. Any excuse would be enough for the whole town to turn on her, so she must never tell a soul of her magic. Not even Niklas. Evie is a fantastic character. She cares about Annemette, whether or not she's Anna or not, though as the story goes on, she becomes more certain that she is. And the prince Annemette is in love with is Niklas, her own best friend. She truly believes they will be happy together, because of how Niklas looks at and treats her. She herself is in love with Niklas' cousin, Prince Iker, who has finally noticed that she's a beautiful girl, and things just seem kind of perfect - Niklas and Annemette, Iker and Evie. But despite how Niklas looks at Annemette, time is running out fast, and he's yet to kiss her - only true love's kiss will keep Annemette alive. Determined not to lose Anna again, Evie starts experimenting with her magic, to try to find an alternative way to keep Annemette alive. It's such a clever, clever story! There's so much more going on than we realise until later, a twist that I did not see coming at all. It's bloody incredible! We get flashback scenes at the end of some chapters, and so, towards the end, we know the way things are heading before Evie does, and it's awful watching things unfold, knowing what's going to happen, and being powerless to do anything about it. It's so intricate as well, all the choices the four characters make that, one after the other, one on top of the other, that lead to this story, how things could have turned out so differently if people had made other choices. Or how others viewed those choices, and what they determined those choices meant. Sea Witch isn't perfect, though. This is the second The Little Mermaid retelling published this year that lulls once the mermaid is human. In the big scheme of things, nothing much happens when Annemette is human, apart from the four spending time together, or separately in couples, during Lithasblot. Niklas, being the heir to the thrown and now of age, has more ceremonial duties to perform during the festival, and the festival itself is interesting, but nothing major really takes place. It does slow down a little. And although I now know, having finished the book, that things definitely are happening in those moments, we just don't realise it, I still think those elements could take place during something a little more exciting. But the characters themselves are awesome, and getting to know them better was enjoyable even if not much is happening. And the story as a whole really makes up for the lull in the middle. Seriously, that ending is incredible! I didn't see it coming at all, but oooh, is it good! I do wish there was a little more explanation of how magic works so I could better understand why what happens, happens. But even so, it was just brilliant! I would highly recommend this villain origin story to all fans of The Little Mermaid! It's just amazing! Thank you to HarperCollins Children's Books via NetGalley for the eProof.